Most of the framework of the new fire station on Kingshill Road has now been erected with much progress being made in just a few weeks. The building will be on three storeys of which the middle one will be used to house the engines, this being on the same level as Kingshill Road on to which they will exit when going out on a 'shout'. At nearby Rednock the concrete structure is essentially complete and some of the curved roof members have now been put in place. During July the town also held its festival which saw many people visiting and joining in the various activities which took place on the recreation ground the centre of the town. The first walls appear at the the new fire station site. 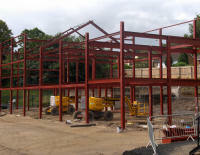 Just over a week later and most of the framework for the new fire station is in place. The fire engines will be garaged on the middle storey which is on the same level as Kingshill Road. The surface is on the new hard sports area in the Rednock site and it awaits colouring and lining. Some of the curved roof members have now been installed on the new Rednock school building. On the weekend of July 12th and 13th Dursley held its town festival and this view of the recreation ground shows a small part of the site where many events were held.